The Dynamic Neuroscreening Device (DND) is nonnon-invasive and is used to detect peripheral neuropathy in patients with diabetes or at risk for diabetes who have yet to exhibit any clinical symptoms and can also establish a patient baseline for future screening. 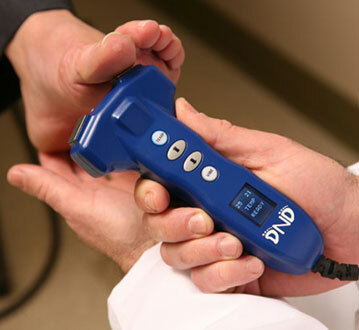 The DND screens for the presence of neuropathy through the use of objective temperature and vibration discrimination testing. "T1D/M2D2 2016 Diabetes Innovation Challenge Finalist"
"Bronze Winner in 2016 worldwide Medical Design Excellence Awards- MDEA"
Peripheral neuropathy is one of the major causes of sensation loss and significantly increases risk of feet ulceration with potential limb loss. Uniform patient screening for peripheral fiber neuropathy by graded temperature and vibration discrimination stimuli. The device may significantly improve patient compliance with medical advice by providing objective numerical data of the sensitivity status.